A show arranged and produced by two long time friends since 1978 Chicago’s Own Rick Saucedo & New Jersey’s Own Tony Grova ! Rick starred in the hit NYC 1978 Broadway play Elvis The Legend Lives On at The Palace Theatre. At one point in 1978 Tony was chosen to be Rick’s understudy as the show expanded but never happened until now! 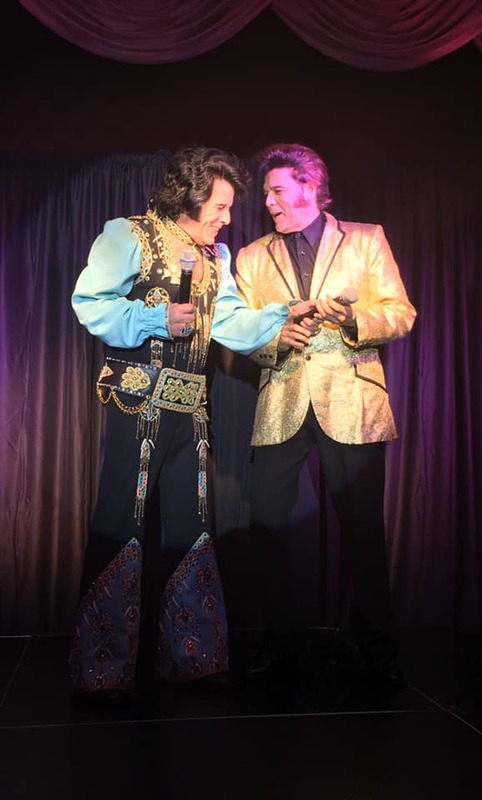 For the first time in 41 years this show will feature a re-enactment of The 1978 NYC Hit Broadway Play Elvis The Legend Lives On that starred Rick Saucedo & will be performed both by Rick Saucedo & Tony Grova ! How the music used to be! ABOUT ELVIS!! More dates coming to an area near you soon! FOR BOOKINGS CALL 973-835-7585 Page is still under construction. Check back often for changes. Below is copy of actual front cover of original playbill from The Palace Theatre that belonged to Tony and had it signed by Rick and DJ Fontana, Elvis’s original drummer the first time he saw the show! Ironically Tony would later go on to work and become friends with DJ over the years as he did with Rick and still is today! Copy of actual page from 1978 Playbill.